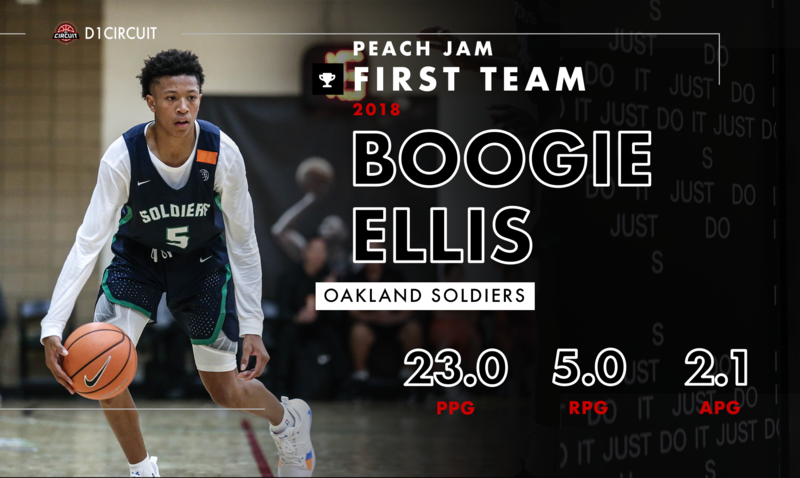 Had Boogie Ellis not already been honored during the regular season, he definitely would have taken home top breakout player of Peach Jam. Ellis took his game to another level for the Soldiers, shooting an outrageous 57.5 percent from behind the arc en route to a 23.0 point per game scoring average. Ellis single-handedly lifted the defending champion Soldiers to a bracket play win over Team CP3, a game that saw him score 18 points in the first half. Blue bloods are starting to show interest, and it's likely Ellis soars into the 2019 Top 25 before long. 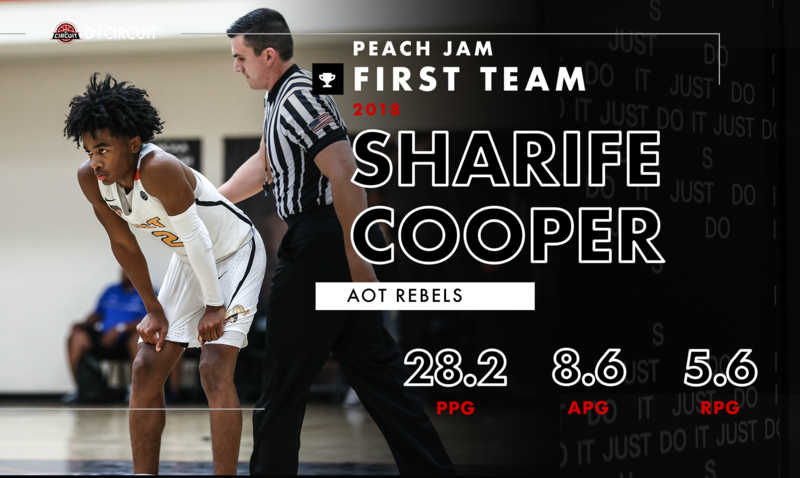 Sharife Cooper was awarded Top Offensive Performer at the 2018 Peach Jam after becoming the first player to lead the tournament in points and assists. Cooper is truly on another level offensively, and through 21 EYBL games, no one has found his kryptonite. Cooper is only a sophomore, so we get the pleasure of seeing one more EYBL campaign from the young man. On top of his offensive performer honor, Cooper was also named Co-Underclassmen of the Peach Jam, sharing the honor with teammate BJ Boston. Did you really expect to find Cole Anthony anywhere else but first team? 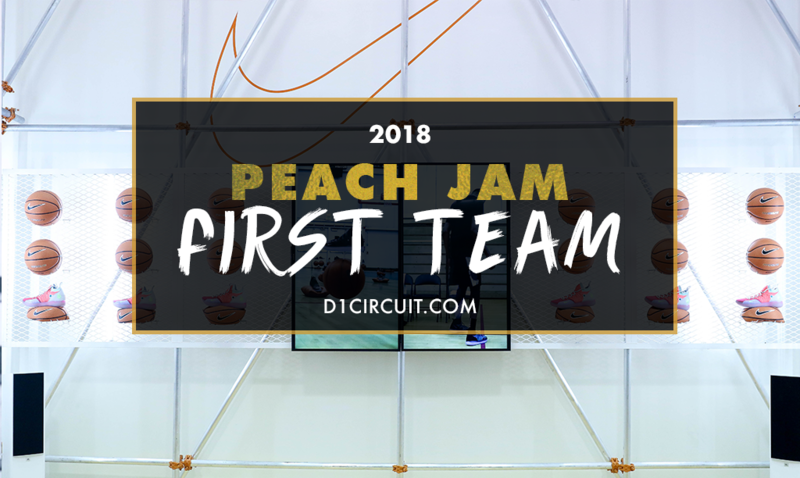 PSA's superstar was dominant in five Peach Jam pool play games, averaging 26 points, eight rebounds and five assists while playing his usual elite defense. Anthony competes harder than just about everyone he matches up against, a trait that has helped separate himself from the pack in the 2019 class rankings. Anthony is as good as it gets in grassroots basketball, and it's a bummer that his unbelievable EYBL career is officially over. 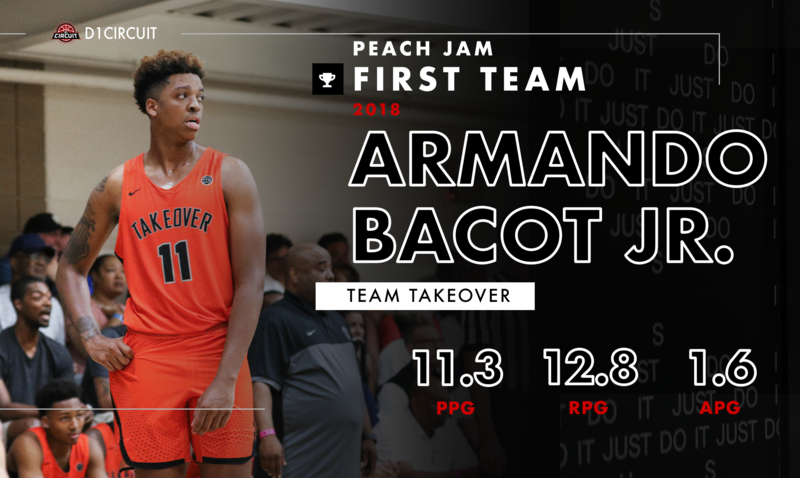 Armando Bacot Jr was named MVP of the Peach Jam immediately after Takeover's title, and deservedly so. The 6-foot-10 big man was a pleasure to watch in Keith Stevens' system, showcasing elite footwork & post skills alongside a star-studded lineup. Bacot fit in perfectly to Takeover's scheme, and the result was the second Peach Jam Championship for DC's EYBL affiliate. 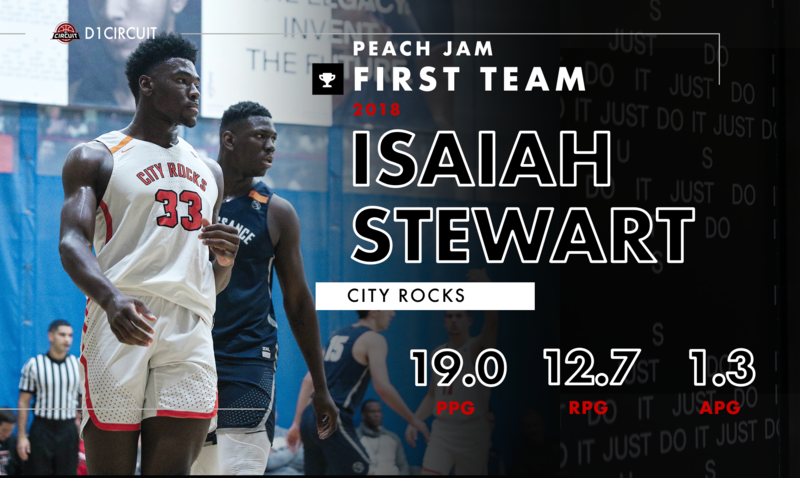 Honestly, it's hard to play much better than Isaiah Stewart played at Peach Jam. The City Rocks' heart and soul was impeccable for head coach Jim Hart, averaging 19 points and 13 rebounds over six games played. He helped lift the Rocks to bracket play, and his individual performance of 24 points and 12 rebounds almost helped them upset eventual champion Team Takeover. Stewart is now being considered a top-five talent nationally, and his college decision is going to massively change a program for the better.